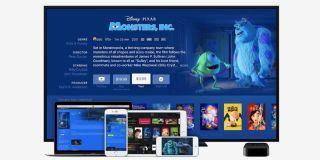 New iTunes rental feature lets you watch across all your Apple devices | What Hi-Fi? The new 'rent once, watch anywhere' feature lets you rent on one device and watch it on another. You can now watch films rented from iTunes on a device other than that you used to rent it. The feature has landed as part of iTunes 12.6, which is rolling out now. Previously, iTunes rentals were locked to the device you used when purchasing the rental. But this feature frees them up, so you can rent on your iPhone while on the way home, then watch it on your Apple TV when you get in. It also lets you start watching on one device, and carry on using another. So to reverse the above example, you could start watching on your Apple TV, then carry on using your iPhone when it's time to nip out. The feature is called 'rent once, watch anywhere'. However, in order to use the feature, you'll need iOS 10.3 on your iPhone and/or iPad, and tvOS 10.2 on your Apple TV. And neither of these software versions are on general release yet, they're locked to developers who can access the beta builds. We're expecting both to drop any day now.